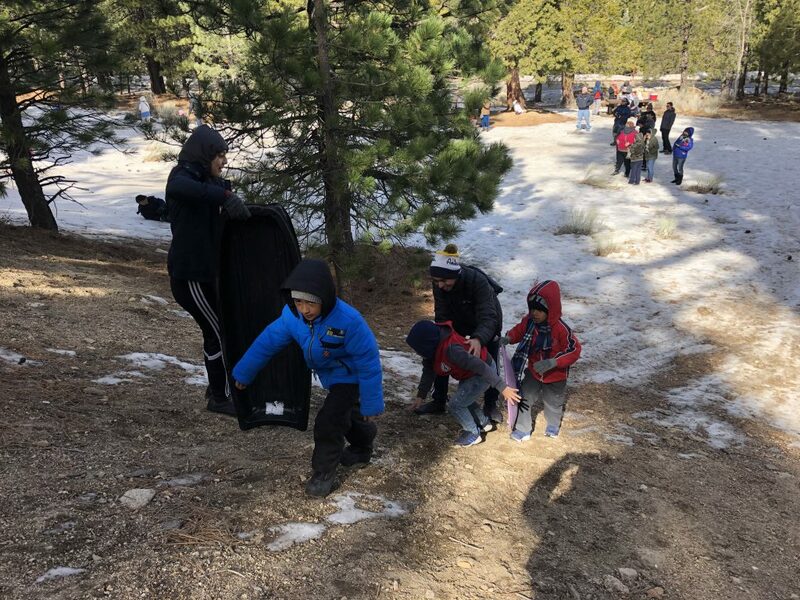 Today students from Paramount High School’s Green club joined Angeles ICO in giving Charles White Elementary students a sledding day! Green Club students helped the younger students climb the bank, get settled on their sleds, pushed them off, caught them at the bottom and provided encouragement. These young leaders donated their time to ensure students like Angie, who had never been on a mountain or been sledding, could have a great first experience! “Sledding is fun!” Angie remarked after several runs down the slope. It was such great day for all of the students and chaperones. Paramount HS students help elementary students up a slippery slope to go sledding. One high school student saw his line of eager sledders replenish at a quick rate and remarked, “They go down (the hill) and then come right back up!” Another young student from Charles White, Luis, had never been to the snow and after several solo sledding runs asked his teacher if he and his best friend could go down together. Mr. Trinh helped the boys pick out a bigger sled. When it was their turn the Green club made sure they were secure before giving them a little push to head down the slope. The boys cruised several yards past the other students’ distances and got up smiling. It was very cold and windy off the Angeles Crest Highway. To ensure participants stayed warm in the wind and snow ICO provided hot chocolate and Cup of Noodles. Green Club students used a shovel to break up chunks of snow for snowballs to be made and smooth out bumps on the sledding slope. Paramount students showed initiative, leadership & communication skills throughout the day, helping the energetic 1st grade students. Many memories were made today, and ICO was glad to make it happen.